The apartment is full equiped!! The apartment is in the center of Paris. Very calm and at the same time in the centre of Paris. All the chic shops, bars, restaurants. cool and young ambiance. 5 min walk to Pompidou Centre, Marais, Forum Les Halles. Metro Les halles 200 m from the apartment. Direct Metro from Charles de gaulle airport, and also direct Metro to Eurodisney. The apartment is full equiped and you will feel a Parisian at home. You can rent bikes 50 m from the apartment. If you need a maid during your stay we can provide you. The apartment is in the 6th floor no elevator Very comfortable, great energy!!! Wonderful, cute apartment. Perfect for two people. Clean, as advertised. Ideal location! Loved this apartment for a few days in Paris. Great neighborhood. The place was cute and clean. Arrival and departure were both hassle free. Very nice flat in perfect place. We spent a very pleasant week in this flat. The location is really perfect: it takes less than 15 minutes on foot to get to Louvre and 5 minutes to subway station. shops of any kinds, bars, restaurants are extremely close. flat is very nice and charming, everything is clean and good, there are just several problems: the kitchen is small and due to the flat's being on the last floor it's not very comfortable to cook much, allthough one certainly can cook there wahtever one wants. if you are going to cook yourself all the time, I wouldn't recommend this apartment to you. The other problem is that in the shower there is no curtain, so one has to wash oneself carefully, lest one should wet everything around oneself. Nevertheless the apartment is great and I am very thankful to it's owner and peaple meeting us there. My daughter and I stayed here for 5 days over Christmas. We have been to Paris many times and try a different location each time, but always somewhere central. This is our favourite location so far. The apartment is 1 minute away from a great pedestrian street full of restaurants which are not just for tourists , plus bakeries, groceries, meat/poultry, flowers, chocolates, chemists, 2 supermarkets - really easy to either eat out or shop and eat at the apartment or a bit of each. It's no more than 10 mins by foot to the Louvre. We walked everywhere - completely safe, always interesting. The apartment is well equipped for 2 and manageable for more - but of course very small, which is normal for central Paris, whether it be a hotel room in this price range or an apartment. It was clean, light and warm. It's up 5 flights of stairs, be prepared! This is also normal, as is the less than luxurious stair well. If you haven't stayed in apartments in many old cities of Europe, be prepared for the stairwells often looking dingy and unrenovated. It does not mean you are staying somewhere bad!!! Sandrine, who met us was also very friendly and helpful. The location of the property was wonderful- in the pedestrian area Montorgueil in the 2nd Arondissement.A few blocks from the Louvre, Pompidou etc. Lots of little bars, and cafes perfect for people watching. Shops are nearby for stocking up the fridge of the small but well-equipped kitchen. The apartment was quite clean, except for hair in the bathroom area. Unfortunately there were the following problems with the apartment equipment, which were known to the owner: toilet that sometimes continued to flush and no direct access to the tank as it is built into the wall (very loud). Table for 2, neither chairs, nor room for 3rd/4th person. (chair number 3 was missing the arm rest and was broken in another spot, as was chair number 4 which was very unstable and couldn't hold the weight of the lightest in our party (50kg, 110 pound). Only 1 blanket for 4 people. (though the owner did offer to bring another one by the following day - we didn't want to wait until 10am to leave the apartment). Otherwise the property is really modern and wonderfully designed -maximizing the space available in the attic apartment. The owner of the property was very responsive but is only available for key hand-off at 3pm and 10am. We were luckily able to pick the keys up outside of this time (4:30 pm) about 20 minute drive away (could have been very tricky without a car). There is public parking in the quarter - search online, discounts for per-booking of parking - to get into the pedestrian area, must press button and say you are driving in to a parking garage. Would be preferable to travel by public transportation - we left our car parked for the duration of the visit. All in all, I would recommend this property for 2 people who know they can be at the property at 3pm to pick up the keys and stay until 10 a.m. to return the keys. - Hair in the bathroom: The apartment is cleaned by a maid each time guests leaves. We never had any complain. It may happen that sometimes you can find a Hair in the bathroom. We are sorry about that, i don't like myself so i can perfectly understand.The day you came i couldn't check since your time arrival was after the time was stipulated and agreed by both sides in the RENTAL AGREEMENT so i wasn't there to check as i usually do when i receive guests in the apartment itself. Chairs: The apartment has 2 chairs around the table . if you had the time to look behind the sofa you could discover 6 more chairs to open .If you needed , it's a pity you didn't ask me if i had more.. In general people use them because they see them. The apartment is for 4 people. You were 5, and i told you that when you insisted. I told you is not an apartment for 5 people specially when you come with kids. We offer you toys for your child and you had blankets for everybody. I think that it was not enough because you mentioned you had cold and it's true we didn't give you more. We will take that in consideration for the next guest and we apologize for that. Towel for your children: I put 2 sets of towels for children in the placard. i don't understand how you didn't see them. I brought them specially together with the toys. Concerning the check in and out time: Before you agreed to rent the apartment i have sent to you a RENTAL AGREEMENT. It's written the check in 3PM and out time 10 AM, so it's strange you say something about it like its sounds strange. When we have the possibility we let our guests enter before, or leave after that hours. But we prefer to write an hour in case we have limitations to receive people in late or early hours. Sometimes people have late hours and we can not receive them so we prefer to mention that in the contract. If we know in advance we do our maximum to be there . But if a guest leaves and other arrives the same day we need minimum hours in between to clean. Hope it's clear and as always , we prefer to read guest's comments to make better our guests stay. We spend a long weekend in this very well equipped apartment. It’s located very close to almost everything in the center of Paris and has a lot of good restaurants and cafes just around the corner. The apartment was clean and nice. We had some challenges with one of the two heaters - but otherwise everything worked well. 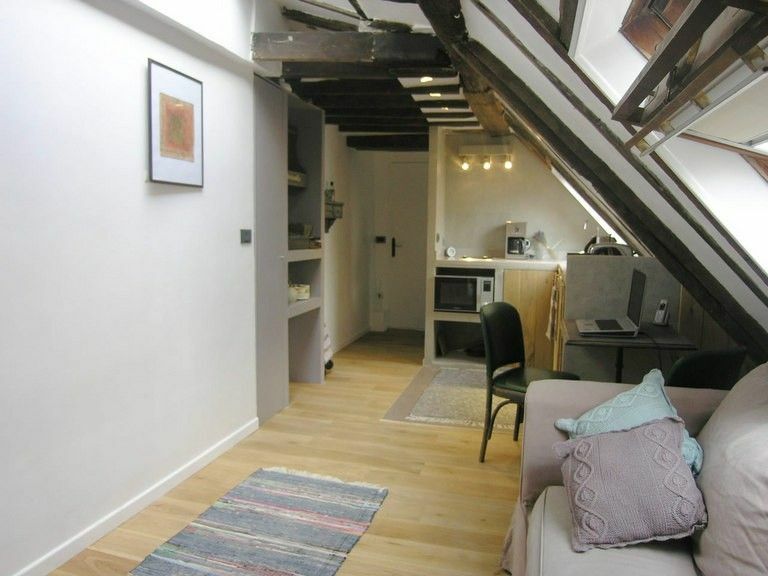 Just 250m from the MARAIS , POMPIDOU CENTRE, MUSEUMS, and 50m from the coolest shops in Paris. Security Deposit equal between 250€ . The method of payment: 50% on booking,50% 15 DAYS BEFORE ARRIVAL. Additional of 60 euro for cleaning after departure no cancellation accepted 30 days before your arrival. check in at 3PM check out at 10am Flexible if no guests arrive the same day.